Waves » Learn » Blog » SSL E-Channel or G-Channel? What makes the SSL E and G channels different? Why – and when – choose one over the other? Take a detailed comparative look at these two legendary channel strip processors that helped shape generations of music. In 1975, a small English company called Solid State Logic (SSL for short) released their first analog mixing console, the SL4000 A Series. It was hardly a rousing success – only two were ordered and built. A couple of years later it was followed by the slightly more advanced B Series; it, too, was met with the sound of one hand clapping, though this time six were sold. The big breakthrough came with the introduction of the E Series in 1979, the desk which, along with its later iterations (including the extremely popular G Series, first released in 1987), not only transformed but dominated the recording industry for decades. What made the SL4000 E Series and G Series so special? In this article, we’ll take a closer look at these two powerhouses, and at the Waves SSL E-Channel and G-Channel plugins that allow you to access the sound of these much-loved consoles from within your DAW. The E Series provided a radical departure from anything that had gone before. It was the first console to offer a compressor/gate on every channel as well as a master buss compressor – features that undoubtedly led to the much wider, and more aggressive, use of dynamic processing in mixing, a trend that continues today. Its onboard computer and ‘Total Recall’ system, which enabled the user to take a snapshot of the desk and recall it at a later date, was another big selling point. But perhaps most importantly, the E Series had its own unique sonic character. While some considered its EQ (four-band and fully parametric) to be somewhat harsh – at least in comparison with the Neves and Tridents found in the studios of the 60s and 70s – others loved its brightness and clarity, which, along with the characteristic punchiness of the dynamics section, made for a distinctive sound. In fact, one could easily make the case that the E Series and later the G Series (which added a number of enhancements, including cleaner circuitry and a moving fader option) defined the entire sound of the 80s. Both were perfectly suited for the ‘big stadium’ pop and rock music of the era, and mixes created on them translated exceptionally well on radio and television. These two innovative consoles opened up a whole new world of opportunities for recording engineers. The E Series and G Series offered virtually identical compression and gating (although later G consoles were outfitted with improved VCA chips), but their equalization facilities differed significantly. The G Series utilized steeper filter slopes and incorporated a variable proportional-bandwidth (‘Q’) design whereby the more you boost or cut, the narrower the Q becomes, thus keeping the overall energy change relatively consistent. In contrast, the frequency bandwidths in the E Series remained constant regardless of the amount of boost or cut, yielding slightly more presence and edge compared with the G Series, which provided a gentler tonal shift (i.e., a smoother sound) at typical EQ settings. (However, at maximum or minimum gain, the same curves result.) And while the E Series allowed the low and high frequency shelving filters to be switched to bell curves, the G Series instead provided switches labeled “LMF/3” and “HMFx3”. These divided the Low Mid frequency or multiplied the High Mid frequency by a factor of three, thus allowing substantial equalization changes at the touch of a single button. Another major difference had to do with the internal componentry. Early E-Series consoles utilized what became known as the “Brown Knob” 02 circuitry, incorporating a “logarithmically symmetric” design that ensures that the ±3 dB up/down points in the low mid and high mid bands retain the same musical interval from the center frequency regardless of frequency and amplitude settings. In 1983, this was replaced with the “Black Knob” 242 EQ, developed in conjunction with legendary Beatles producer George Martin for the first (E Series) SSL console to be installed in AIR Studios. This circuitry offered enhanced cut and boost ranges (±18 dB instead of ±15 dB), along with a steeper 18-dB/octave high-pass filter for tighter control of low frequencies. G-Series consoles came equipped with newer 292 or 383 G-EQ circuitry, which offered greater gain change and a slightly different curve resulting from a pre-boost dip and a pre-cut rise, as well as a broader Q for more extreme equalization. The dynamics section is identical in both plugins, consisting of a soft-knee compressor/limiter and an expander/gate, both of which can be used either pre- or post-equalizer. As in the original consoles, the compressor applies automatic make-up gain, calculated from the Ratio and Threshold settings, in order to maintain a steady output level. Likewise, the default compressor attack time is program-sensitive, responding to changes in the incoming audio signal. 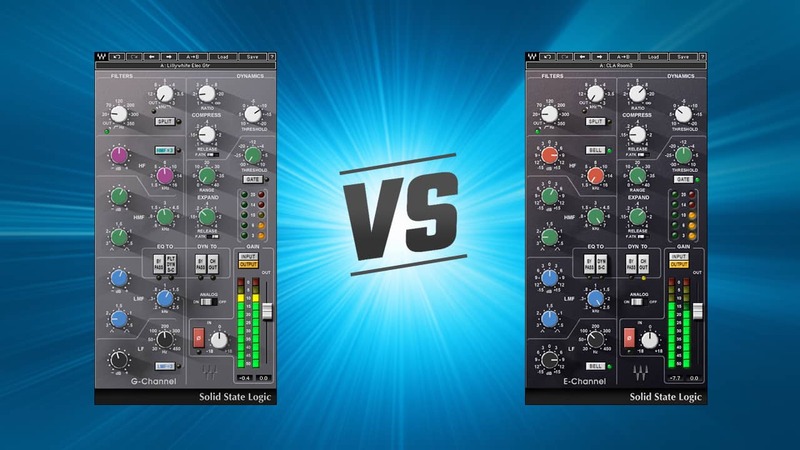 In both plugins, bypassing either the dynamics section or the EQ section does not result in a flat signal, but rather one which mimics the flat response of an actual hardware SSL channel strip. A “Dyn S-C” control in the E-Channel switches the filters and EQ into the dynamics sidechain, enabling simple de-essing, etc., while a “FLT Dyn S-C” control in the G-Channel switches just the filters into the sidechain. Other features include dedicated compressor and gate LED-style gain reduction meters, a trim knob, a phase (polarity-reversal) button, and an output fader and meter. As in the SL4000 consoles, the order of the filters, EQ, and dynamics processing can be changed as desired. One other interesting control unique to these plugins is an “Analog” on/off switch. When turned on, a realistic emulation of the noise and distortion created by the original hardware is added to the signal. If you’d rather have digital precision, simply switch it off – something you couldn’t do in the original consoles! Back in the 80s and 90s, there was endless debate about which sounded better, to the extent where some studios commissioned SSL consoles with an even split of E-EQ and G-EQ channel modules. 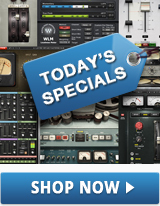 Today, of course, you can easily have the best of both worlds in the form of the Waves E-Channel and G-Channel plugins. The E-Channel delivers the classic big-console sound we all know and love, while the G-Channel adds notable midrange punch that enables individual elements like vocals or guitar to pop through the mix a little more. In any case, a little experimentation will go a long way in determining which is best for your particular needs, and when. Either way you go, you will have the legendary, familiar sounds of SSL as tools to facilitate your mix. For more tips on mixing with the SSL E-Channel and G-Channel plugins, check out our video tutorials on the SSL 4000 Collection page.